By Gallinule - Admiration by Saraband. Occasionally, two superior racehorses will appear at the same time. Such was the case of the legendary British mares Sceptre and Pretty Polly. Foaled just two years apart, the careers of these two extraordinary fillies actually overlapped for two seasons, although they never met. Sceptre's remarkable feat of capturing four classic races during her brilliant career left racegoers feeling there they would be unlikely to see another such as she in their lifetimes. But then along came Pretty Polly. Pretty Polly was a working girl compared to her more glamorous contemporary. 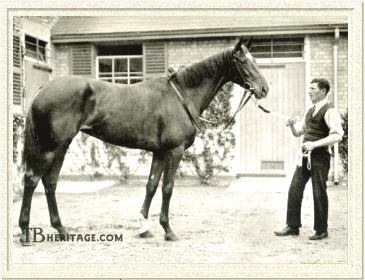 Sceptre was the product of generations of blueblood breeding in the Duke of Westminster's Eaton stud, her sire the dual classic winner Persimmon, and her dam Ornament, a full sister to Triple Crown winner Ormonde. Pretty Polly's background was far removed from fashionable, and her breeder, Major Eustace Loder, had only been involved in seriously breeding horses for a little over a decade. Major Loder was born in 1867 and served in the 12th Lancers for a number of years. In the early 1890s he started racing horses, and had some success with runners over hurdles. In 1892, he enjoyed seeing his horse Billow win a stakes at Ascot. Within five years, Loder had purchased, sight unseen, the Eyrefield Lodge Stud on 120 acres near the Curragh in Ireland. Loder engaged his friend, trainer Noble Johnson, whom he had met on a brief visit to the Curragh two years before, to manage the property. Broodmares were bought at inexpensive prices. Astrology, who became the dam of Star Shoot, was acquired for 450 guineas, and Concussion, who became the dam of Llangibby and Hammerkop, was purchased for £500. His most fortuitous purchase, however, was Admiration, a chestnut filly with drooping quarters, bent hocks, and a mediocre pedigree. Even so, Loder liked her, and paid 510 guineas for her as a yearling in 1893. Admiration Admiration was sired by Saraband out of Gaze, by Thuringian Prince. Saraband was by Derby winner Doncaster's son Muncaster out of Highland Fling, by Ascot Gold Cup winner Scottish Chief. Saraband had the misfortune to come along in the same year as the great Ormonde, and was thoroughly outclassed by that foe when they met in the Two Thousand Guineas. Without the specter of Ormonde, Saraband did manage to capture the New Stakes and the Chesterfield Cup, and he had been a top juvenile. He was a moderately popular stallion that came up with the good filly Siffleuse, winner of the One Thousand Guineas and Yorkshire Oaks in 1893, a fact which no doubt persuaded Loder to purchase Admiration. Saraband was later sold to Germany where he was twice leading sire. It is necessary to go back five generations, to Admiration's fifth dam, to find some depth of quality. That mare, an unnamed daughter of Pantaloon, produced Chester Cup winner Leamington, who went on to become a leading sire in America. Leamington's half-sister, Chaperon, also was known as Sweet Pretty Pet and Fatty, and it was under the latter name that she won some small races. Her daughter, Wallflower, did not race and produced only one winner. Wallflower's daughter, Eye Pleaser, was only good enough to run in selling races. Her daughter, Gaze made only one racecourse appearance, in a selling plate, and finished nearly last. Gaze did wind up as a broodmare for trainer Robert Peck, who must have seen something in her, but she failed to produce anything of note. She was sold at the dispersal of Peck's bloodstock after his death, and after passing through several hands, was eventually sold as a hack for fifteen guineas. As a two-year-old Admiration was started in some important races, notably the Richmond Stakes at Goodwood, but she finished unplaced. After that, Admiration had to descend to much more modest company, and at Stockbridge as a three-year-old, she finished in the money for the first time, placing second. Sent to Ireland, she won a £50 handicap at Baldoyle. At age four she won a handicap at Leopardstown. Admiration also ran many times over hurdles, and placed in a military steeplechase at Punchestown. Despite her lack of racing class, Loder kept her as a broodmare. She proved a tremendous foundation mare for Loder. She foaled nine winners, and founded a female family, which in addition to Pretty Polly and her descendants, included such top class runners as King John, Tehran, Cresta Run, and Craganour. Gallinule Pretty Polly was the result of mating Admiration with the Irish-based stallion Gallinule. A magnificent physical specimen, Gallinule was sired by the tough cup performer of the 1870s, Isonomy. Gallinule's dam was the Hermit mare Moorhen, a campaigner through the age of nine, with victories in selling races on the flat, over fences, and in hunt flat races to her credit. In twenty-one lifetime starts, Gallinule only won three races, those at the age of two, including the important National Breeders' Produce Stakes. At age three, Gallinule garnered a second place finish, but the rest of his career was anticlimactic, as he developed into both a roarer and a bleeder. This last infirmity was attributed to Hermit, himself a breaker of blood vessels and inclined to transmit this ailment to his descendants. Sold to Captain Henry Greer, Gallinule was sent by his new owner to Brownstown Stud in Ireland, and there, despite his initial poor patronage, he went on to lead the British sire list in 1904. In addition to Pretty Polly, Gallinule got St. Leger winners Wildfowler and Night Hawk, Two Thousand Guineas winner Slieve Gallion, and stayers White Eagle and Hammerkop. By 1900 Gallinule had sired St. Leger winner Wildfowler, and a number of winners of the Irish classic races; he had also gotten the brilliant, unbeaten juvenile Sirenia (1895), who had been bred by Loder from the mare Concussion. Thus, Admiration was sent to visit Gallinule, and dropped her filly foal in March of 1901. Pretty Polly was a chestnut with a star and white left forefoot. She was a strong-boned filly of good size, like her sire. Though she had the gentle personality of her mother, she also possessed a certain amount of "electricity" in her temperament. This electricity led to three incidents during her early training in Ireland, any one of which by itself, could have led to tragic consequences. In one of the episodes, she was being driven in long reins on the Curragh and got loose. She galloped along a narrow path with a high cliff wall on one side and a forty foot drop down an embankment into a sand quarry on the other. The feisty filly was not recaptured until she had traversed this perilous path twice. On another occasion, Pretty Polly was being exercised with a 140 pound rider up. Some other yearlings, carrying nearly thirty pounds less, were also out for a gallop. Pretty Polly was steered near them to take a peek, when she took charge of her rider and bolted, joining the others and winning the gallop. And on yet another occasion, she jumped the fence of an enclosure she was sharing with some other young fillies and landed in a sand pit. Pretty Polly was sent to be trained by Peter Purcell Gilpin. An Irish military man, Gilpin had trained with some success in Ireland, and had bought, trained, and owned Sirenia. Gilpin moved his base of operations to England, and after the turn of the century built Clarehaven Lodge (named after his 1900 Cesarewitch winner, whose winnings (in bets) funded its construction), near Newmarket. Gilpin was at first unimpressed by Pretty Polly, later remembering, "The first time I saw her in a paddock at Eyrefield Lodge she struck me as being almost too powerful. If anybody had told me the filly I was looking was going to develop into a great racemare I should have laughed." Pretty Polly was introduced to British racegoers on June 27, 1903 in the British Dominion Two-Year-Old Plate at Sandown Park. She had shown her trainer some promise in a gallop with the older horse Delaunay, in which receiving 23 pounds, she was beaten less than a neck. That work set her up perfectly for her debut, in which she burst from the gate, took the lead immediately and won off by a conservatively estimated margin of ten lengths. In third place was a colt by Isinglass named John o' Gaunt, destined to make an important mark as a sire. Pretty Polly proved that her brilliant victory was not an anomaly when just three weeks later, she easily defeated ten rivals in the National Breeders' Stakes at Sandown Park. Sent north to Liverpool, Pretty Polly took the measure of a solitary opponent in the Mersey Stakes at Liverpool. The rest of Pretty Polly's two-year-old season turned into a procession of brilliant and masterful victories. Beginning with her next start, the Champagne Stakes at Doncaster, the filly was partnered by young up-and-coming jockey William Lane, who would ride her exclusively for the next year. Among the challengers to Pretty Polly in the Champagne Stakes was Leopold de Rothschild's St. Frusquin colt, St. Amant, winner of both the Coventry Stakes and the Prince of Wales's Stakes. He was no match for her, as she won in a canter by a length and a half from Lancashire, with St. Amant third. The Autumn Breeders' Foal Plate at Manchester was next on Pretty Polly's agenda. One opponent faced her and she won again in a canter. This served as a prep for the Cheveley Park Stakes at Newmarket on October 14th against six other fillies. Pretty Polly and rider Lane won by three quarters of a length. Two days later, Pretty Polly again met St. Amant, as well as Imperial Produce Plate winner Lancashire, and the good Meddler colt Hands Down, in the prestigious Middle Park Plate. In her usual style, the daughter of Gallinule burst away from the barrier and raced along uncontested, passing the winning post three lengths in front of St. Amant. Two more facile victories, a day apart, during the last week of the October meeting followed. In the first of these, she beat a solitary rival in the Criterion Stakes, and in the second the best rival she beat was the filly Bitters, destined to capture the Yorkshire Oaks the next season. Just one-half hour before the running of this race, the mighty Sceptre, then four-years-old, captured the Limekiln Stakes over that season's Triple Crown champion Rock Sand. Fans at Newmarket had certainly been treated to a spectacular card of racing that afternoon. In nine starts as a two-year-old, Pretty Polly was not once defeated. In four of those races, the charts described her as winning in a canter. She had humiliated the best colts of her generation, not to mention the fillies. St. Amant, the best of the colts, was very highly regarded, and proceeded to justify that high esteem by going on to capture the Two Thousand Guineas and the Derby the next spring. Pretty Polly's unique personality developed more strongly with the confidence of winning, and her personality quirks endeared her to the racing public. After each victory, she came to expect a lump of sugar from her trainer's wife to be given to her in the winner's enclosure. She developed a strong attachment to a cob named Little Missus, who became her inseparable companion during her racing days. Little Missus would create a good deal of amusement by cantering with Pretty Polly to the start of many of her races. There were times when after a win, Pretty Polly would whinny for her friend, the two would affectionately rub noses, and then Little Missus would accompany Pretty Polly, her lad and her trainer, back to the stable. Pretty Polly went into winter quarters the prohibitive favorite for the next season's filly classics, and it was to the regret of Eustace Loder and Gilpin that she had not been entered for the Derby. Consequently, the first target for the brilliant filly was the One Thousand Guineas over a straight mile at Newmarket on April 29, 1904. There were skeptics who doubted whether a filly possessed of such brilliant speed could handle the classic distances. As one person observed, "Pretty Polly may take rank with the most brilliant sprinters we have known, but because of her breeding she cannot be another Sceptre who is best over a distance of ground." Pretty Polly won the One Thousand Guineas in a canter by three lengths in 1:40, then a record for the race. Her towering reputation left her with only three overmatched opponents for the Oaks Stakes at Epsom a little over a month later. Narrowly averting a mischievous kick from her inseparable companion, the cob Little Missus, Pretty Polly was under restraint virtually the entire one and a half mile distance, and won by a conservative three lengths. Those who witnessed the race were convinced she could have won by much more had she been given free rein. Accustomed to receiving a lump or two of sugar in the winner's enclosure after each victory, Pretty Polly was treated to her usual reward this time by no less a personage than racing enthusast King Edward VII. The one mile Coronation Stakes at Ascot and the one mile and four furlong Nassau Stakes at Goodwood merely served to keep the filly on her toes. She won both races in easy canters, and firmly established herself an overwhelming favorite for the St. Leger at Doncaster on September 7th. As before the Oaks, there were still some who expressed doubt whether Pretty Polly could stay the 1-3/4 mile distance of the St. Leger, especially against colts. Opposing Pretty Polly in the St. Leger were St. Amant, looking for a sweep of the Triple Crown; Henry the First, a classy son of Melton who had run well against the likes of Rock Sand and Darley Dale during the summer; and St. Denis, a St. Simon colt which had finished third behind St. Amant and John o' Gaunt in the Derby. Pretty Polly made these colts look like common hacks, as she raced comfortably throughout the race, assumed command easily and drew off in a canter to beat Henry the First by three lengths with St. Denis and St. Amant unplaced. Her time of 3:05.8 seconds was a record for the race. The St. Leger, having taken so little out of her, Gilpin brought her out again two days later for the Park Hill Stakes, run over the St. Leger course against fillies. Bitters, recent victress in the Yorkshire Oaks, was Pretty Polly's best opponent, but she could only get to within three lengths of the cantering favorite at the finish. In winning this race, Pretty Polly pulled off the double of winning the St. Leger and Park Hill Stakes that the mighty Sceptre had tried and failed to accomplish two years previously. The Park Hill marked Pretty Polly's fifteenth straight victory, and no one would have dared to suppose she would ever taste defeat, let alone in her next start. But that is exactly what happened when Loder and Gilpin decided to run Pretty Polly across the English Channel in Paris, in the Prix du Conseil Municipal against older horses on October 9th. A strong gallop against her stable companion, the good staying Gallinule daughter, Hammerkop, showed she was suffering no ill effects from her strenuous campaign. Despite the fact that the French had a complicated system of weights and penalties for stakes races won, which meant that Pretty Polly would actually be giving weight to some of her older opponents, confidence still abounded in her stable. But things began to go awry. The worst thing was the injury to her regular pilot, William Lane. The young jockey was thrown from his mount in a horrific spill and suffered a severe head injury. In fact, Lane was never to ride Pretty Polly again. Danny Maher was selected to partner her. Gilpin hired a special train to take her directly to Folkestone for her crossing of the Channel. She was booked on the what was supposed to be the steadiest of the channel-plying ships, the "Mabel Grace." And the stable lad traveling with her was given £100 to grease the palms of French railway officials to make sure her train from Boulogne to Paris had the speediest possible journey. All these contingencies were for naught, as storms forced a delay in her departure, and provided a rough crossing. Her train from Boulogne to Paris was repeatedly shunted into sidings to allow other trains to pass, despite the liberal tipping with Gilpin's money. She finally reached the warmth and comfort of her Paris stable late on Friday evening, less than 48 hours before the race. The next day, heavy rain fell, soaking the course. Sunday dawned clear and crisp, but the going was soft and muddy, definitely not conducive for the tired filly to perform at her best against the formidable competition she was to face. And the competition was indeed formidable. The best French representative was the Bay Ronald son,Macdonald II, recent winner of the classic Prix Royal Oak (French St. Leger). The main threat from England was Lord de Walden's colt Zinfandel. Zinfandel had been deprived of competing in the English classics owing to the death of his previous owner, Colonel Harry McCalmont, the rules then in force voided his classic engagements upon the death of his nominator. This left the English classics of 1903 to the mercy of Rock Sand, who swept the Triple Crown. 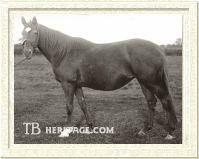 Zinfandel was bred to be a good horse, being by Persimmon from the Bend Or mare Medora. Earlier in the spring, Zinfandel had captured the Coronation Cup, defeating both Sceptre and Rock Sand in the process. In fact, Zinfandel was noteworthy in that he faced both Sceptre and Pretty Polly during his career. Neither Pretty Polly or Zinfandel could handle the going at Longchamp. The longshot Presto II made all the running, with Zinfandel and Pretty Polly racing behind him. It was expected the pacesetter would weaken and be devoured by the two English horses. But to the shock of the fans in attendance, Presto II kept on going, passing the winning post over two lengths in front of Pretty Polly with Zinfandel a half length back of her in third. The racing world was shocked at the defeat of Pretty Polly, who had seemed invincible. The British could hardly believe that the enormously popular filly had actually been beaten. Some of the French observers were more cynical, such as the anonymous lady who exclaimed "Ah, c'est Anglais!" Jockey Danny Maher came under some criticism for his ride of the favorite and responded with the opinion that Pretty Polly was not a true stayer, despite her victories in the Oaks and St. Leger. Maher tenaciously held this opinion of Pretty Polly for the rest of her racing career, and indeed, seemed determined to prove it. But no one could doubt that the filly had proved herself mortal after all, the combination of the exhausting journey and trying running conditions conspiring against her. With her loss, Pretty Polly followed in the footprints of Sceptre, also beaten in France during her classic season. Pretty Polly returned to England, and less than three weeks after her Longchamp debacle, coasted to an effortless victory in the Free Handicap over a mile and two furlongs at Newmarket. St. Amant was unplaced. On the same card, Zinfandel also rebounded to his best form in capturing the Jockey Club Cup. Pretty Polly was then given a long and well-deserved rest, and did not appear before the public again until the Coronation Cup at Epsom during Derby week, June of 1905. In this race, Pretty Polly again met Zinfandel, as well as the French horse Caius, a high class multiple stakes winner in France. Ridden by Otto Madden, Pretty Polly was reserved off Zinfandel and Caius as those two made the running. When Madden gave the filly her head, she stormed past them and drew off to win by three lengths over Zinfandel, with Caius a further five lengths in arrears. Her time of 2:33.8 constituted a new record for the 1-1/2 miles, and was more than five seconds faster than Cicero had taken to win the Derby the previous afternoon, and would prove to be more than four seconds faster than Cherry Lass would take to win the Oaks a day later. Her time would not come close to being threatened for over twenty years, when in 1928 Apelle set a new record in that race, running it in 2:33.0. Pretty Polly had made her two opponents seem like common platers, yet they were outstanding horses in their own right. Zinfandel went on to capture the Ascot Gold Cup and Caius captured the Prix d'Ispahan only a week after his drubbing in the Coronation Cup. Pretty Polly It was intended for Pretty Polly to take on Zinfandel again in the Ascot Gold Cup. However, Pretty Polly lost her footing on a patch of slippery ground shortly before the race and strained the muscles in her hindquarters, thus keeping her out of the Ascot classic. In her absence, Zinfandel won comfortably. Pretty Polly was not seen out again until the autumn, when she scored facile victories at Newmarket in the Champion Stakes and the Limekiln Stakes. Her last race of the season was the Jockey Club Cup, over two miles and two furlongs at Newmarket on November 2nd. In that race, Pretty Polly would meet Bachelor's Button, a handicapper and stayer of the highest class, having accounted for the Champion Stakes, the Hardwicke Stakes, and the Doncaster Cup at various stages of his career. Bachelor's Button also had the services of Danny Maher in the saddle. He had recently ridden Pretty Polly to victory in the Champion Stakes, but was still convinced she was not a genuine stayer and was determined to beat her with Bachelor's Button, in whom he had absolute faith. Horn Head served to set the pace, and Pretty Polly and Bachelor's Button raced behind. About a hundred yards from the finish, Pretty Polly's rider gave her the signal and the mare forged ahead to beat Bachelor's Button by half a length. There was considerable debate as to whether Pretty Polly had an easy time of it in her victory. The chart of the race read that she won hard held, and observers in the winner's enclosure declared that the filly was hardly winded from her victory, while Bachelor's Button was utterly exhausted from trying to run with her. Bachelor's Button's jockey, Danny Maher, loudly proclaimed that if there had been a proper pacemaker for his mount, he would have defeated the mare, for he swore she had reached the limits of her stamina at the finish of the race. What could not be debated was the fact that although Pretty Polly had a shortened season, it had been brilliant. It was announced she would remain in training as a five-year-old for another crack at the Ascot Gold Cup. Her first objective for the new season was the Coronation Cup, and Pretty Polly tuned up for it with an easy cantering victory over outclassed rivals in the March Stakes at Newmarket. Pretty Polly faced only two horses in the Coronation Cup, old rival St. Amant and Achilles, a three-year-old who had just defeated Bachelor's Button in the Burwell Plate a short time earlier. The race proved to be merely an exhibition of Pretty Polly's superiority. Under Bernard Dillon, the filly made virtually all the running and won easily by a length and a half from Achilles, with St. Amant third and last. Her time of 2:36.8 while not extended equaled her stablemate Spearmint's winning time in the Derby the day previous, which had been a record for that race. Based on this performance, the possibility of Pretty Polly succumbing to defeat in her next start, the Ascot Gold Cup, seemed unthinkable. But, as in her expedition to France, things started to conspire against her. She had a wart on her belly lanced shortly before the race, her beloved cob, Little Missus became ill and was unable to accompany Pretty Polly to Ascot. The weather was oppressively hot, and Pretty Polly was obviously uncomfortable, as well as unsettled by throngs of admirers wanting to catch a glimpse of her both in her stable and in the paddock before the race. It was observed that the filly was uncharacteristically reluctant to go to the track for the race. Added to all this, the compact field of five for the 2-1/2 mile race was stellar. Her opposition would consist of Bachelor's Button, Achilles, Cicero, and St. Denis, the latter acting as pacemaker for Bachelor's Button. St. Denis was a high class horse in his own right, having won the Princess of Wales's Stakes in addition to his third place finish in St. Amant's Derby. And he did his job very well, breaking from the gate under jockey G. McCall and setting a tremendous gallop with Achilles behind him and Cicero running hard held in third. Pretty Polly and Bachelor's Button ran at the back of this five horse field. Bachelor's Button was under the reinsmanship of Danny Maher, who exuded confidence in his ride as the race progressed, for St. Denis was doing exactly what he wanted by setting such a brisk pace. With six furlongs left to run, St. Denis threw in the towel, and Achilles took over, but he soon tired and allowed Bachelor's Button and Pretty Polly to pass him with about a quarter mile left in the race. For a few seconds, it seemed as if Pretty Polly could put the race away and win with her usual brilliance, but Maher and Bachelor's Button stayed right with her. One hundred yards from the finish, Bernard Dillon was forced to give the tiring filly some sharp stings with the whip, something Pretty Polly had never before been subjected to. It was for naught. Bachelor's Button courageously forged ahead of the public's heroine and galloped on to a length victory over Pretty Polly in a record time of 4:23.2 for the 2-1/2 miles. The crowd in attendance was so shocked, there was not a cheer to be heard for Bachelor's Button, who had, after all, run a brilliant race. Indeed, the poor horse was viewed as something of a villain. Danny Maher was triumphant, stating that his appraisal of Pretty Polly as a non-stayer had been correct. Pretty Polly's trainer, Peter Gilpin, blamed jockey Bernard Dillon for an overconfident ride and not taking the threat of Bachelor's Button and Danny Maher seriously enough. Somewhat overlooked in the post-mortems of the race was the gallant role of pacemaker St. Denis had played, for without him, Bachelor's Button would have had a formidable task of beating the mare, even if she were not in her best form. The Gold Cup proved to be Pretty Polly's last race. It had been intended for her to contest the Doncaster Cup, but hard ground due to the hot, dry summer proved more than she could stand. She jarred her off fore joint a few days before the race and was withdrawn. Since the injury required some time to heal, further racing that season was ruled out, and the decision was made to retire her. In all, Pretty Polly won 22 of 24 starts with two second place finishes. She had been as dominating at 2-1/4 miles as she was at five furlongs. She had captured three classic races, and had put together a win streak of fifteen straight races. There were the inevitable debates of who was better -- Sceptre or Pretty Polly -- each filly having their partisans. But probably the best way to settle the argument is to fall back upon the opinion of Robert Sievier, owner and trainer of Sceptre for much of her career. His answer--"They were both too good to be compared." Like Sceptre, Pretty Polly was considered a disappointment as a broodmare, her offspring failing to live up to the lofty expectations held for them. And like Sceptre, Pretty Polly went on to found a female family dynasty which is still producing top class runners to this day. Pretty Polly later in life Pretty Polly was returned across the Irish Sea to the place of her birth, Eyrefield Lodge Stud, to begin her new career as a broodmare. This phase of her life got off to a rocky start, as for the first two seasons she was barren and slipped twins to Spearmint in her third. The situation prompted Gilpin to suggest putting her back into serious training--a suggestion Eustace Loder wisely refused to consider. Her temperament also posed a problem. Described as sweet-tempered in training, she became nervous and irritable once she entered stud. 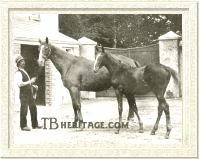 Finally, in 1911, Pretty Polly gave birth to her first live foal, a bay colt by Spearmint. The colt was named POLYGONUM, and from his birth in 1911 through 1920, Pretty Polly produced a foal every year except 1917. In all, she produced ten foals: six colts and four fillies. Once she became a successful mother, her temperament calmed considerably. Sadly, the eagerly-awaited colts failed to amount to anything. Polygonum ran nine times, and won only a f100 race at Wolverhampton. He died in 1914. Pretty Polly's next son was a chestnut colt by St. Frusquin named ST. POLYCARP. He ran only once in 1914, and he, too, died that year. CHIPILLY, a bay colt by Spearmint, ran only three times and failed to win. He was exported to Australia by G.W. Dight, Jr., for whom he won the only race in which he started, over sixteen opponents at the Queensland Turf Club's autumn meeting. Although he won by a length, he broke down in that race, and was retired to Dight's Yetman Stud, where he got a couple of winners in the geldings Ship and Sapilly, but was not a success. PASSCHENDALE was foaled in 1916 and was a brown colt by Polymelus. He also failed to win and was exported to Belgium. 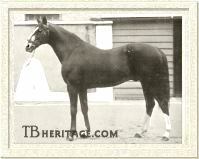 CLACKMANNAN was foaled in 1919 and was a bay colt by Lomond. Clackmannan was the best of Pretty Polly's sons, for he won six races and deadheated in another. He was exported as a stallion to Japan, where he did exceptionally well, leading the Japanese sire list in both 1933 and 1934 as well as enjoying success as a broodmare sire. TUDOR KING was Pretty Polly's lastborn son, and was sired by Swynford. He failed to win in twelve attempts on the flat and gained his only victory in a hurdle race at Lingfield. Like his half brother Passchendale, he was exported to Belgium. This record of Pretty Polly's sons had to be very disappointing, as she was bred to some of the best stallions then standing in the British Isles--Polymelus, St. Frusquin, and Swynford. However, all four daughters of Pretty Polly were brought back to Eyrefield Lodge to become broodmares, and each one founded a major branch of what has come to be known as the Pretty Polly family, to this day, one of the most influential in the Stud Book. Molly Desmond MOLLY DESMOND (1914, by Desmond) died in 1928 at the early age of fourteen, but she was nevertheless an extremely successful broodmare. She produced five winners including: Zodiac (by Sunstar), winner of the Irish Derby and Irish St. Leger; Spike Island (by Spearmint), winner of the Irish Two Thousand Guineas and the Irish Derby; Strongbow (by Swynford), winner of the Greenham Plate; Sarita (by Swynford), winner of the York Fairfield Plate; and Golden Silence (by Swynford), second to Pennycomequick in the 1929 Epsom Oaks. Molly Desmond was also the dam of the non-winning Spearmint filly Lady Maureen and the maiden Molly Adare, by Phalaris. The branch of Pretty Polly's family through Molly Desmond has proven the most prolific. To the present day, this family has yielded over sixty horses which have either captured classic races or grade/group I events. The most important producing daughters of Molly Desmond were Lady Maureen, Molly Adare,and Sarita. Lady Maureen,was sold and went to France as a broodmare for the Rothschild family's Haras de Meautry, in France. She founded a family deep in classic-winning ability. Her daughter Moireen Rhue, by Swynford, became the second dam of dual Italian classic winner Macherio (by Ortello). Another daughter, the Tetratema filly Mauretania, had several foals, the most important of which was Montagnana, who produced French Two Thousand Guineas winner Guersant amd Gramd Prix de Saint-Cloud winner Ocarina. French champion sire Luthier descends from Montagnana. Molly Adare was a total failure on the racetrack, but she proved a wonderful matriarch in her own right. Her family over the generations have captured classic events in Great Britain (Brigadier Gerard, defeated only once during his turf career, later sire of St. Leger winner Light Cavalry), Italy (Val d'Erica), and Czechoslovakia (Victoire, Victoria, and Victor), as well as grade/Group I events in the United States, France, and Ireland. Sarita has exerted an extraordinary influence via her daughter, the Abbot's Trace filly Sister Sarah, foaled in 1930. This filly managed to win only two small races, but at stud, she produced a total of twenty foals, eight of whom were winners. Her daughter, Lady Angela (by Nearco) became the dam of Nearctic, a champion runner in Canada, but more important as a stallion, sire of the great stallion Northern Dancer, Icecapade and Explodent. The in-bred Northern Taste (by Northern Dancer and grandson of a half-sister to Nearctic) led the Japanese sire list a total of ten times, eight times in succession between 1985 and 1992. The family of Sarita over the decades has been responsible for fourteen classic champions in six countries: England (St.Paddy, Flying Water, To-Agori-Mou, and Shadayid), France (Masarika), Canada (Titled Hero, Key to the Moon, Square Angel, and Kamar), Ireland (Alydaress and Opale), Belgium (Epsibal), and Barbados (Another Chick). Great Nephew and his offspring, Prix de Diane winner Mrs. Penny, as well as Grundy and the ill-fated Shergar, both Epsom and Irish Derby winners, descend from Sarita. 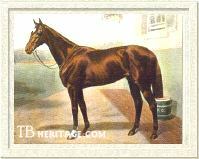 DUTCH MARY (1915, by William the Third), Pretty Polly's second daughter, bred six major winners, including: Spelthorne (by Spearmint), winner of the Irish St. Leger; Christopher Robin (by Phalaris), winner of the St. James's Palace Stakes; Sister Anne (by Son-in-Law), second in the One Thousand Guineas and third in the Oaks to Pennycomequick and "cousin" Golden Silence after her saddle slipped; and Duccia di Buoninsegna (by Bridge of Earn). Purchased as a yearling at Newmarket by Italian breeder Federico Tesio, Duccia di Buoninsegna emerged as the best three-year-old filly of 1924 in Italy, her victories including the Italian One Thousand Guineas. As a broodmare, Duccia di Buoninsegna produced another Italian champion three-year-old, Delleanna (by Clarissiumus), who became a tremendous foundation mare for Tesio's Dormello Stud. To the cover of Blenheim II, she produced Donatello II, winner of the Italian Derby and a successful sire. 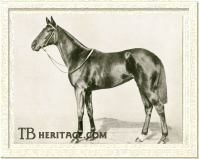 To the cover of Blenheim II's son, Mahmoud, came Donatello's three-quarter sister Donatella, victress in the Gran Criterium and champion two-year-old filly of 1941 in Italy. Donatella produced two classic champions: Daumier (Italian Derby, Italian St. Leger) and De Dreux (Italian St. Leger). In an instance of inbreeding, Delleana was mated with Spike Island, the son of Spearmint and Pretty Polly's daughter Molly Desmond. The resultant foal, Dossa Dossi, earned championship laurels at two in 1932, capturing the Gran Criterium, and repeated as a champion in Italy at three with wins in the Italian One Thousand Guineas and Italian Oaks. Dossa Dossi wound up in Poland, where in 1951, at the age of 21, she foaled a colt, De Corte, which became a classic winner, winning the Polish Derby and Polish St. Leger. Polly Flinders The third daughter of Pretty Polly, POLLY FLINDERS (1918, by Polymelus), produced nine daughters. The best of these was the filly Arabella,by Buchan. Foaled in 1926, she was from the same foal crop as Golden Silence and Sister Anne, and proved a brilliant juvenile, winning the Queen Mary Stakes, Imperial Produce Stakes, and the Champagne Stakes. Like her dam, though, Arabella failed to train on and did not enjoy a successful three-year-old season. At stud, Arabella was the most important link in he chain between her dam, Polly Flinders, and succeeding generations of this branch of Pretty Polly's family. Arabella had several daughters, but her lasting claim to fame as an influence to later generations came via her granddaughter Overture, a filly by Dastur out of Arabella's daughter Overmantle, by Apron. Overture proved unable to win on the racetrack, but as a broodmare bred twelve winners. Her best were The Cobbler (by Windsor Slipper), which captured the Middle Park Stakes, and Sea Symphony (by Fairhaven), a winner of the Irish One Thousand Guineas. Overture's daughter Forecourt, by Fair Trial, produced King George VI and Queen Elizabeth Stakes winner Supreme Court. Her daughter Flirting, by Big Game, produced Arctic Explorer, winner of the Eclipse Stakes, as well as Narraly, a winner of the Spanish Derby and Spanish St. Leger. Champion filly Marwell, English and Irish Oaks heroine Unite, and Ascot Gold Cup winner Paean all also trace back in the female line to Overture. Of the other eight daughters of Polly Flinders, none could be described as significant as Arabella, yet some high class horses descended from them have graced the turf over the decades. Pastilla, a Group I winning filly in Argentina, descended from Parchment, a daughter of Polly Flinders by Apelle. Chilone, winner of the Gran Premio del Jockey Club, descended from Kilted Kitty, a daughter of Polly Flinders by Swynford. And daughter Flinders, by Tetratema, became the second dam of the Straight Deal filly Kerkeb, winner of the Yorkshire Oaks, Park Hill Stakes, and Newmarket St. Leger. Flinders was also the fifth dam of Group I Japan Cup champion Katsuragi Ace. BABY POLLY (1924, by Spearmint), the youngest daughter and last foal of her famous mother, was the dam of Colorado Kid, a Colorado colt which was victorious in the Doncaster Cup. Baby Polly was also the second dam of Sea Parrot, whose descendants did well in Brazil and France. Baby Polly is also represented as the third dam of of classics-placed runner Vienna, the sire of champion and important stallion Vaguely Noble. With this powerful family, it seems difficult to comprehend that Pretty Polly was initially condemned as a severe disappointment as a broodmare. In the short run, that may have been the case, though having two daughters capable of winning at what today would be the Group I to Group III levels, would be enough for any breeder to claim their mare a success as a producer. But the expectations for Pretty Polly were so high it was virtually impossible to meet, let alone, exceed them. Given the fact that her female family had been so weak for generations prior to her birth, it seemed a longshot that Pretty Polly would make a mark in the Stud Book. Despite the success of her mother as a producer, there were skeptics who still proclaimed the old adage that hard-raced mares failed to amount to anything as broodmares. But the fact that Pretty Polly's family has proven so enduring and still capable of coming up with Grade/Group I level performers over seventy years after her death has transformed her once plebeian family into one of the most highly respected in the breeding world. Major Eustace Loder died at the age of 47 in the summer of 1914, having long suffered from the kidney disorder Bright's Disease. His dying wish was to view his beloved mare Pretty Polly as close as possible one last time. The mare was led along the lawn and towards the house. At her owner's bedroom, Pretty Polly's head was put into the room through an open window. Thus her owner was able to pass away peacefully, having seen one last time the horse which had given him so much pleasure during his life. Eyrefield Lodge passed to Loder's nephew, Giles. Pretty Polly was pensioned not long after the birth of Baby Polly, and for the next seven years, lived a quiet, pampered life, undisturbed save for the occasional visitor to her realm. In nearby paddocks, her daughters and granddaughters, and then later, great-granddaughters, grazed and nursed their babies. Stud groom Frederick Maher cared for Pretty Polly during the last few years of the old champion's life, every day grating carrots, apples, and brown sugar to mix in her mash. Her teeth were worn and she could not chew her food properly, and eventually she went blind, though her hearing remained unimpaired. Stud manager Noble Johnson's daughter, Madeline McCombe remembered "When my father would enter the paddock and call "Poll, Poll," she would always amble up to him for her lump of sugar. She was wonderful on her legs--her pasterns never dropped as old horses' usually do." 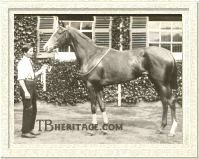 On August 17, 1931, Pretty Polly was humanely put down, aged 30. The old mare had begun to lose condition quickly that summer and the decision was made to release her from mortal life with quiet dignity. Pretty Polly was buried near the house at Eyrefield near the graves of Spearmint and Spion Kop. Today, there are still descendants of Pretty Polly grazing contentedly in the lush fields of Eyrefield, within sight of their ancestress's final resting place.